As a veterinarian, Jennifer Lopez, DVM SGU ’11, MBA SGU ’13, is accustomed to making important decisions that affect the welfare of her patients. Now as Medical Director of VCA Castle Shannon Animal Hospital in Pittsburgh, PA, her decisions affect the entire practice. It’s a position for which she is well prepared, having obtained both her Doctor of Veterinary Medicine and Master of Business Administration from St. George’s University. Having made a positive impression at Banfield Pet Hospital during four separate stints on her breaks from school, Dr. Lopez began practicing as an Associate Veterinarian at Banfield’s midtown Miami location in 2011. It was during that time that she enrolled in SGU’s MBA program, specializing in multi-sector health management. With the exception of two one-week residency sessions in Grenada, classes were held entirely online, which worked well with her hospital schedule. She completed her MBA in fewer than 18 months, and graduated in 2013 with a deeper understanding of international business, global health, and principled leadership. Dr. Lopez now oversees 12 doctors and 30 support staff in her role as Medical Director. She also works as an Emergency and General Practice Veterinarian, visiting with patients for well visits and conducting critical care treatment, including surgeries, on a regular basis. In addition, the hospital gives back to the community, hosting community days, donating their services and educating owners on how to best take care of their pets. For her leadership, Dr. Lopez was recognized in the 2016 edition of Icons of Pittsburgh, a book that annually recognizes prominent figures in the Steel City. 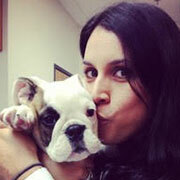 Dr. Lopez grew up in Miami, FL, where her parents bred Rottweilers. “We always had puppies around, so I thought that was a normal thing,” she said. “I don’t even know what else I would do if it didn’t involve animals.” She obtained her Bachelor of Science in animal biology from the University of Florida in 2001, and went on to earn a BS in business administration from the University of Phoenix in 2004. While pursuing those degrees, she worked in UF’s College of Veterinary Medicine as a veterinary technician, specializing in dermatology, which she also researched in depth. Tara Paterson, DVM SGU ’03, and Janet Caracciolo, DVM SGU ’03, came through Florida during their clinical year and spoke glowingly about their experience at SGU. They encouraged her to apply, and she enrolled in 2006. Dr. Lopez found veterinary school to be a challenge, but she was up to that challenge. She embraced the Grenadian culture and appreciated the hands-on experience that the School of Veterinary Medicine provided early on, identifying Drs. Timothy Ayliffe and Marta Lanza-Perea as especially influential figures in her education. She and her classmates held numerous community outreach events, including vaccine clinics and sponsoring lunches. In addition, she served as President of the Jewish Student Association and American Animal Hospital Association, mentored incoming students as part of the SGU’s Footsteps program, and held the position of Student Representative for Pfizer and VCA Hospitals.